Please include a few details, location, camera and lens specs etc. You're an optimist! Serengeti to aardvarks - wi ne does that to me too. It was a usual safari morning. We left camp being watched by Impala and Zebra, and cruised along. All of a sudden George, our guide, got busy on the radio. A few seconds later a call: "Hold on guys, an aardvark with a baby was located." So we raced to the spot, where another guide had spotted the elusive animal. The mother was already in its burrow, but the youngster was busy exploring the place, most recently we guess it couldn´t find the entrance to the hole. We were able to watch the little guy for almost 30 minutes. I am just looking over all these Aardvark shots, I´ve made in these 20 minutes, there are so many nice ones. I have to sort out those with to many blades. I hope I won´t bore you. Wow Wild Dogger, those are stunning - gorgeous little creature. Puts mine to shame! Two shots from me (the only other one I have is a very blurry back end disappearing into a bush that could have been anything!). EOS40D with Sigma 120-300 f2.8, ISO 1600, f2.8, 1/100 (top) and 1/200 (bottom), -1ev (I've found that dialling in minus a stop of exposure compensation when shooting at night under spotlights reduces the amount of burned out highlights and gives you a shorter shutter speed that means more sharp(ish) shots. You can then bring back the shadow detail when you process the RAW later). Both taken at Limpopo-Lipadi in September this year just yards from camp. Never...amazing stuff. So the adult didn't come out? The youngster is adorable! Not that I would have known that it was one in the absence of the adult aardvark picture! Really lovely shots, Wild Dogger. Please do post all the ones you like. So rare to see daytime images and of this quality. But this is my first and only ever sighting 2 years ago in Sth Luangwa, elated nonetheless! He then trundled off into the scrub never to be seen again. It was, believe it or not his 3rd sighting in 25 years in the bush but the first time anyone with him had got any images and certainly my first ever encounter! A privilege and a thrill to see this rarely encountered mammal foraging for termites on the dry Katete riverbed. 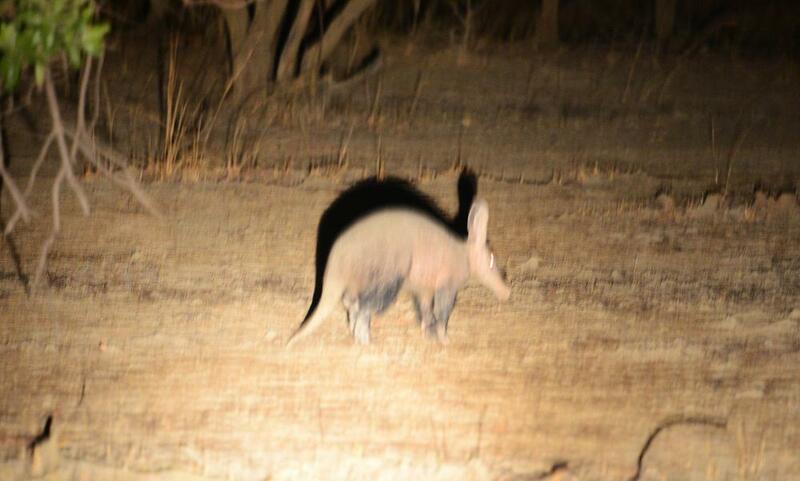 I've only seen an aardvark once and sure enough it was on a night drive in South Luangwa Valley National Park. It was something I'll never forget. I hope one day, I can add to this thread ............. At the moment, never seen one! So, who will join Thomas to add to this thread??? One more safari in the bag ......... Alas, my first Aardvark still awaits!!! Okay - here's my plan. Next time I'm in Kwando ....... If we find an active Aardvark hole, am going to do an after dinner visit and just hang out there for an hour or two - might that work? A guests photo taken in the Luansanda area of the Kafue National Park last year on one of our Mobile trails. It was super chilled but not the greatest shot!